•	‘Drone Wars: Second Strike’ (soft launch pub. Kemojo Kuuhuub Studios Inc. 2017)……. sound designer, music editor. •	‘Hempire’ (pub. LBC Studios Inc. 2017)……. sound designer, composer, music editor. •	‘Undead City’ (pub. Kemojo Studios Inc. 2016)……. sound designer, composer. •	‘Sky Punks Dash’ (pub. Rovio / Fathom Interactive Inc. 2014-2015)……. composer, music editor. •	‘Puzzle Knights’ (pub. Virtual Intelligence Inc. 2013)……. composer, music editor. •	‘KnightScape’ (pub. Virtual Intelligence Inc. 2012)……. composer, music editor. •	‘Sky Pirates of Neo Terra’ (pub. Fathom Interactive 2012)…….music editing, consulting. •	‘Facebreaker’ (pub. EA 2008)……..pre-production, design of interactive music and sound implementation. •	‘Mario Super Strikers’ (pub. Nintendo 2005)…… composer, music editor. •	‘Hulk’(pub. Vivendi / Universal 2003) …. composer, music editor. over 2 million copies sold to date. •	‘Dark Angel’ (pub. Fox / Sierra 2002) …… composer, music editor. •	‘A.I.’ (unreleased Microsoft 2002) …………………… composer, music editor. •	‘Jackie Chan’s Stunt Master’(pub. Midway 2000) …………composer, music editor. •	‘NHL Championship 2000’(pub. Fox Interactive 1999) …………composer, music editor. •	‘ESPN Hockey’(unpublished ESPN 1999) …………… composer, music editor. •	‘NHL All Star hockey ’98’(pub.Sega 1997) ………… composer, music editor. •	‘NHL Powerplay ‘98’(pub.Virgin Interactive 1997)…………composer, music editor. •	‘Final Girl’ Feature Film (Final Girl Productions Inc. 2014) ……………music cue sheet log. •	‘Giants of Rock and Roll’ 5 part radio series and CD box set (1990) ……………co-composer of theme with Mitchell Drew. •	‘Sky Punks Dash’ (pub. Rovio / Fathom Interactive Inc. 2014-2015)…….race finish crowd sound design. •	‘Puzzle Knights’ (pub. Virtual Intelligence Inc. 2013)……. game team producer / project manager, audio director. •	‘KnightScape’ (pub. Virtual Intelligence Inc. 2012)…….game team producer / project manager, audio director. •	‘Sky Pirates of Neo Terra’ (pub. Fathom Interactive 2012)…….consulting. •	‘Kaia’s Quest’ (pub. Fathom Interactive / Big Fish Games Inc. pub. 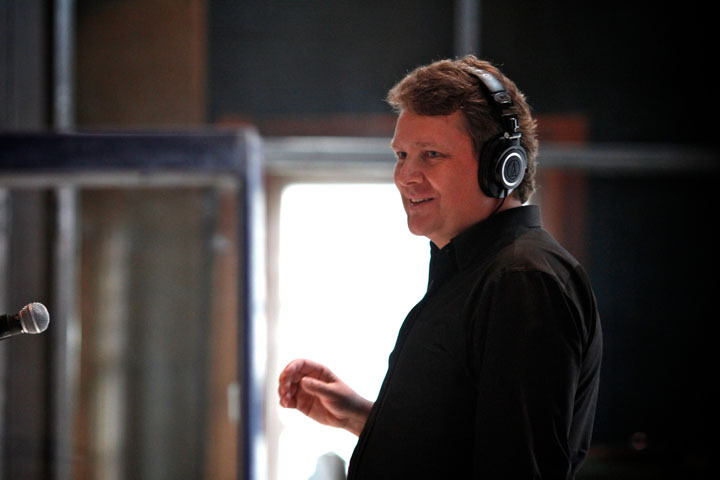 2012)…….sound design, voice director. •	‘Trinity Souls of Zill O’ll.’ (pub. KOEI TECMO Japan 2011)…….English language localization project manager, voice director, voice actor. •	‘Snappy Games Inc.’ (start up game company 2008-2009)…….contractor / various demos / consulting. •	‘Facebreaker’ (pub. EA 2008)……..audio director. •	‘Fight Night 3 – PS3’ (pub. EA 2006)……..audio director. •	‘Mario Super Strikers’ (pub. Nintendo 2005)…… audio director. •	‘Hulk’(pub. Vivendi / Universal 2003) ….audio director. •	‘Dark Angel’ (pub. Fox / Sierra 2002) ……audio director. •	‘A.I.’ (unreleased Microsoft 2002) ………………………..audio director. •	‘Simpson’s Road Rage’(pub.Fox 2001)………dialogue mastering (uncredited). •	‘Dark Summit’(pub.Microsoft /THQ 2001)………..additional sound effects (uncredited). •	‘Jackie Chan’s Stunt Master’(pub. Midway 2000) …audio director. •	‘MTV Sports ‘Pure Ride’ (pub. THQ 2000)……additional music mastering (uncredited). •	‘Bloodlines’(pub.Sony Europe 1999)…………..music mixer. •	‘NBA Basketball 2000’ (pub. Fox Interactive1999)………..dialogue implementation design. •	‘NHL Championship 2000’(pub. Fox Interactive 1999) …..audio director. •	‘ESPN Hockey’(unpublished ESPN 1999) ……………audio director. •	‘NHL All Star hockey ’98’(pub.Sega 1997) …………audio director. •	‘NHL Powerplay ‘98’(pub.Virgin Interactive 1997)…..audio director. •	‘Puzzle Knights’ (pub. Virtual Intelligence Inc. 2013)……. ‘promotional trailer announcer’, ‘viking’, ‘dark knight’. •	‘KnightScape’ (pub. Virtual Intelligence Inc. 2012)……. ‘viking’, ‘dark knight’. •	‘Trinity Souls of Zill O’ll.’ (pub. KOEI TECMO Japan 2011)…….’ninja’, ‘soldier’. •	‘Mario Super Strikers’ (pub. Nintendo 2005)…… ‘stadium announcer’. •	‘Hulk’(pub. Vivendi / Universal 2003) …. ‘The Hulk’. •	‘CSI Crime Scene Investigation’ (pub. THQ 2003) …… ‘LVPD officer 2’. •	‘Dark Angel’ (pub. Fox / Sierra 2002) …… ‘soldier over radio’. •	‘Dark Summit’ (pub. Microsoft/THQ 2001) …… ‘slope patrol over bullhorn’. •	‘Puzzle Knights’ (pub. Virtual Intelligence Inc. 2013)……. script writer for promotional trailer. •	‘KnightScape’ (pub. Virtual Intelligence Inc. 2012)……. script writer. •	‘Mario Super Strikers’ (pub. Nintendo 2005….script writer.